The physics of computer games is based on our own perception of reality. It might feel as if the pull in the trebuchet’s slack is perfect, the angle is set correctly for you to make your shot, while all your nger actually senses is a smooth touchscreen. By presenting the UGEARS mechanical models project on Kickstarter two Ukrainians decided to freshen upour memories about actual real-life mechanics. Their mechanical assembly models allow you to feel everycog, experience the work of energy that is not coming from an electrical cord. Working with these mechanisms brings up forgotten knowledge and skills. It is almost like taking a bite of your favorite pie from childhood – you will recognize this excitement when the model, fully assembled by your own hands, starts going. It will take you from one hour to half a day to put one model together. to make repairs or replace parts. In order to make this possible, we had to invent a lot of tricks. Today, the solutions we discovered allow building a three-dimensional mechanical moving model out of a set of at details. At that, due to the specic nature of our models, we are quite limited in terms of shapes and connecting methods we can utilize. We have to wrestle with a problem of designing seemingly simple parts – which made of plastic or metal would be quite basic – to make the whole breakthrough at the end. The models have simple gearing as well as bevel gears, ratchets, pendulums, ywheels, leverage mechanisms, transmission belts, Geneva drives, wooden bearings, and pneumatic systems. Sometimes, it takes us months of cuts and tries to nally say “Eureka!” It wouldn’t go amiss to mention that one of the glue-less connecting methods we invented has been internationally licensed. quality control checks every step of the production. Our models will serve you for years, and after that, the constructions can be recycled with no harm to the environment. Today we have more than 10 models including “Steam locomotive”, “Tractor”, “Chronometer”, “Dynamometer”, “Trailer”, “Tram”, “Mechanical Theatre”, “Mechanical box”, “Engine”, and “Safe”. We are continuously working on new designs for the future models. Our idea list has over 100 new mechanisms. Some people see our models as real-life steam-punk designer items; others expect us to reach the level of automatons created by the masters of the past. We will follow the collectors’ anticipations to make sure our designs are desirable and appreciated. We put special meaning and ideas in every model. For example, the “Tram” is the most romantic mechanism, while the “Tractor” is an amiable one. The motion of the gears has its dazzling magic and attraction. The chronometer ticks away the time. The tractor rides alone with a busily rattling. The locomotive is a mechanical embodiment of power and movement. It is not just a construction we wanted to create but a piece of art that will bring the beautiful world of mechanics closer and make it more comprehensible. We give people what they miss – the feel of real motion, real mechanics that they make work by themselves. The kit has all you need for assembly: a set of high-quality plywood boards with laser cutout parts, detailed step-by-step instructions, and additional details, including toothpicks used as axles and pins, rubber bands, and in some cases – shing-line. Toothpicks can be a bit surprising. Even though they work perfectly, we consider changing them to more presentable specially manufactured details. Specially designed axels would have to virtually retain the same characteristics – slightly wider ones will increase tension, while longer axels and pins lose durability. Toothpick sit reliably inside and are very easy to replace at the same time. 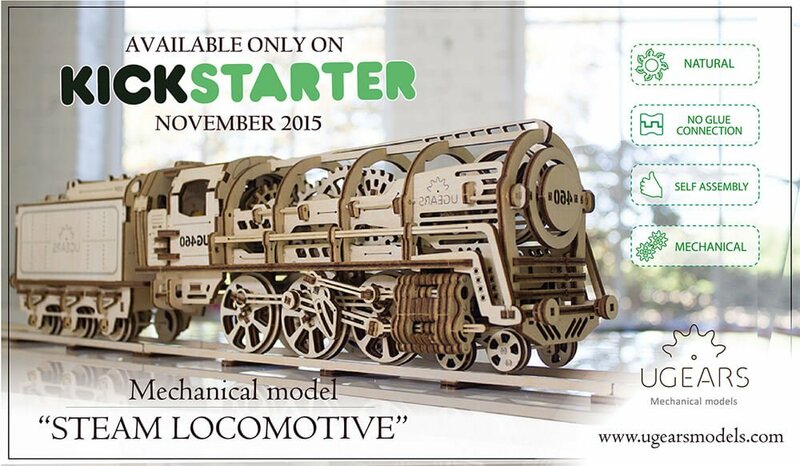 On Kickstarter, we present our exclusive model – the locomotive. It looks realistic and very unusual at the same time. Made of wooden parts assembled without glue, which allows them to retain mobility, the locomotive is a very impressive mechanism. Spinning gears, pistons and wheels carry the core and soul of XIX century engineering. Equipped with a rubber band motor, the model can run up to a distance of 5 meters. We designed the locomotive so that you could observe the working pistons and valves – moving in anti-phase like in a real steam engine. The model has many technical details that make it even more interesting. The lever switches regimes: forward, back, and idle. Another lever gets the whole mechanism going. The train has a folding ladder, doors, tender hatch, and a tow-bar. The locomotive kit includes 500 detailed parts but we also have models that are not so complex. ce rubber band. This model went through a great deal of improvements and renements to become this beautiful piece of machinery that anyone can put together for their delight. One of our most exciting models is the Tractor – rattling greetings from the past century. The model is using a rubber band motor. It has a transmission switch that provides three options: “park”, “drive” and “sport”. You wind up the mechanism in the “park” regime and switching it to the “drive” mode you make it go at an easy pace growling and moving pistons. Switch to “sport” and your Tractor will gain an all-red speed! It also can come with an optional trailer with a drop side. business cards and bankcards. As well as a recently released Safe with a proper mechanic safelock with a three digit code you can set. We designed a pneumatic motor with no additional apex seals. It works on a slight air pressure such as, for example, a simple balloon would provide if attached to the motor. ers other exciting collectibles: a mechanical theatre in which interchanging characters show a small play, as well as a large combine, and dynamometer. As they say, men are big children, only their toys are more expensive. We want our models to have interesting mechanics as well as to be attractive as something you’d like to give or receive as a gift or a souvenir. Elaborate designs with many mechanical parts and gears is something indispensably interesting and spectacular especially in the process of working. orts to create our own mechanical 3D model production based in the suburbs of Kyiv, Ukraine. Today we have a team of 20 enthusiastic people. Work is a pleasure for them. They invest their creativity and love in their craft, which you receive in each of the models. Due to a high level of accuracy and quality, it is easy to put the details together forming a complete model. One of the connecting methods we invented and use has an international license. This is our rst project on Kickstarter. We are a small company. Although our production line is fully established and a lot of amazing mechanisms have already been created. Having Kickstarter support, we’ll be able to hire more designers and release new models. We have a list of ideas that counts over a 100 new concepts we want to realize and present to you. We believe that crowdfunding is the best way to expand the audience interested in innovational products. Discover a whole new world of 3-D puzzles with UGEARS!